MTP fiber cable in data center becomes increasingly popular in data center with the wide deployment of 40G and 100G network. It is common that 40G and 100G network usually based on 12-fiber MTP networking system. However, not all the 12 fibers of MTP cable are used. There are usually 4 fibers left unused, if you are using a 12-fiber MTP cable to transmit 40G with QSFP+ module or 100G with QSFP28 module. 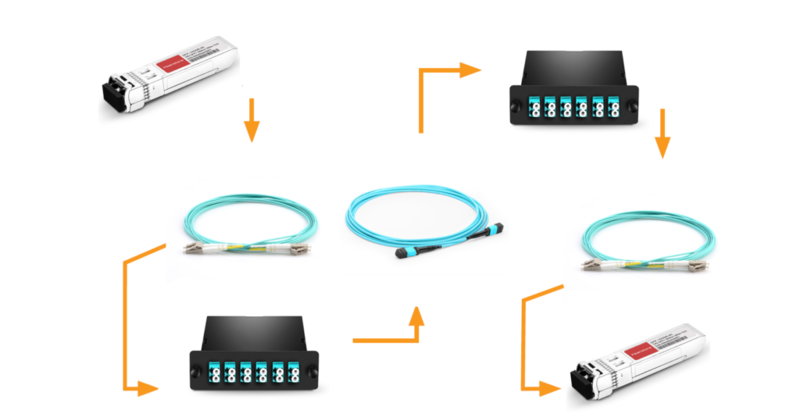 The following shows how 12-fiber MTP fiber cable works when it is used to be connected with 40Gbase-SR4 QSFP+ module. If more 12-fiber MTP cables are used, more optical fibers will be wasted. As IEEE standards like 40GBASE-SR4 and 40GBASE-SR10 uses only 8 fibers for dual-way transmission, manufacturers provide new versions of MTP fiber cable which contains only 8 optical fibers but still used the standard MTP interfaces. Network built with 8-fiber MTP system can transmit the same data with less cost and higher density compared with 12-fiber MTP system. All fiber will be 100% utilized in base-8 MTP products. It could be a cost-effect solution for both 40G to 40G transmission and 40G to 10G transmission. 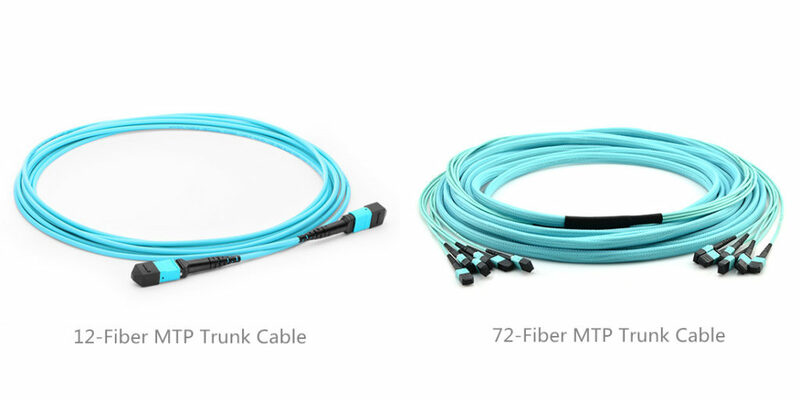 8-fiber MTP trunk cables and 8-fiber MTP-LC harness cable are already provided in the market. There are also rack designed 8-Fiber MTP breakout panels for 40G to 10G applications. However, most MTP cabling systems are based on 12-fiber or 24-fiber MTP system, especially for backbone cabling. MTP conversion cables are provided in the market which offer conversion between 12/24-fiber MTP and 8-fiber MTP cabling systems. The following shows two types of 8-fiber MTP conversion cables which can provide 12-fiber to 8-fiber MTP conversion and 24-fiber to 8-fiber MTP conversion separately. If you have already deployed 12-fiber MTP cabling system in your data center, 2*3 MTP conversion cable is suggested to be used. 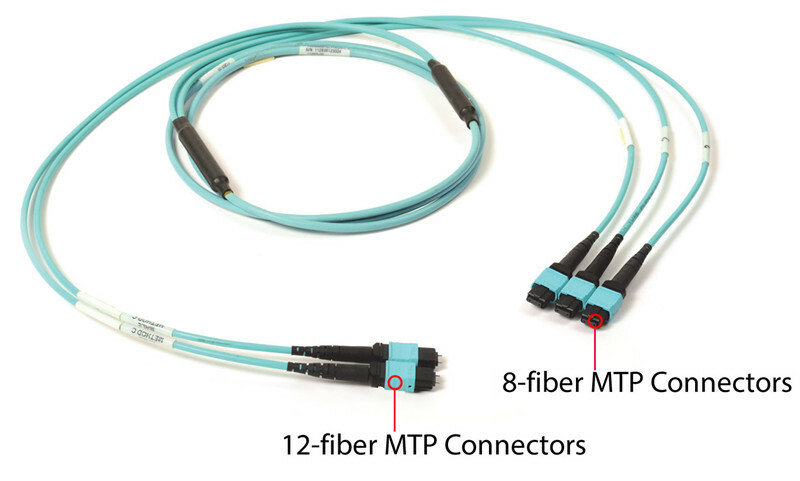 With one end terminated with two 12-fiber MTP cable and the other end terminated with three 8-fiber MTP connectors, 12-fiber to 8-fiber MTP cabling conversion could be achieved, as well as 100% optical fiber utilization in 12-fiber MTP system. 1*3 MTP conversion cable has a 24-fiber MTP cable on one end and three 8-fiber MTP cable on the other end. With this cable, a length of 24-fiber MTP cable can provide three ways of 40G signal dual-way transmission. All the fibers in a 24-fiber cabling system cable be used. It is clear that the 8-fiber, 12-fiber based and 2-fiber based cabling system will exist for a long term in 40/100G network. 8-fiber MTP cabling system can provide higher optical fiber utilization with lower cost and higher cabling density. If you want to transfer 12-fiber MTP system to 8-fiber MTP system, you can use MTP conversion cables. 8-base MTP system, could be regarded as an additional option for the existing fiber network infrastructure. This entry was posted in Fiber Cabling, Fiber Patch Cable, MPO Assemblies and tagged 12-fiber MTP, 8-fiber MTP, MTP cable, MTP fiber cable on April 28, 2017 by Alice Gui. 12-fiber MTP and 24-fiber MTP cables are widely used in 40G and 100G high density cabling. However, in many cases, not all the fibers are used. 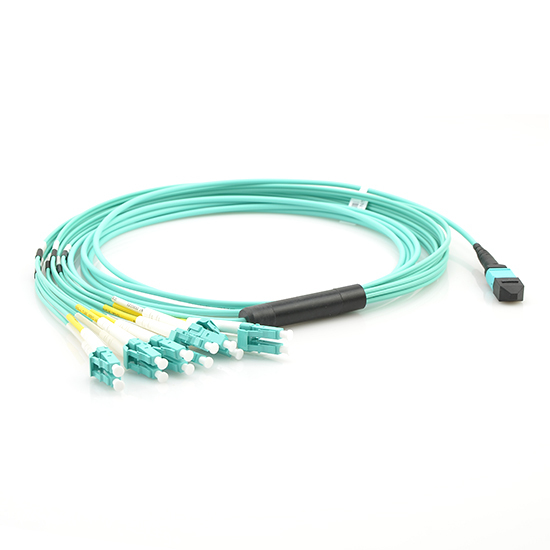 For instance, to connect a 40G-SR4 QSFP+ module, we usually use a 12-fiber MTP cable with only 8 fibers in use. If you have built a 24-fiber cabling system, you can use MTP conversion cable to make full use of the existing optical fibers. The total fiber counts of the above three MTP conversion cables are all 24. But the can provide different connections in multi-fiber cabling system. The following will introduce the applications of these cables. This MTP conversion cable has one end terminated with a 24-fiber MTP connector and the other end terminated with two 12-fiber MTP connector. With this cable, two 12-fiber optical singles can be transferred on to a 24-fiber cable for transmission. In multimode cabling system, the optical signals of two 40G-SR4 QSFP+ modules can be transmitted over a single 24-fiber MTP cable as shown in the following picture. 1*3 MTP conversion cable has one 24-fiber MTP connector terminated on one end and three 8-fiber MTP connector one the other end. The 8-fiber MTP connectors can be connected to 40G-SR4 QSFP+ modules. 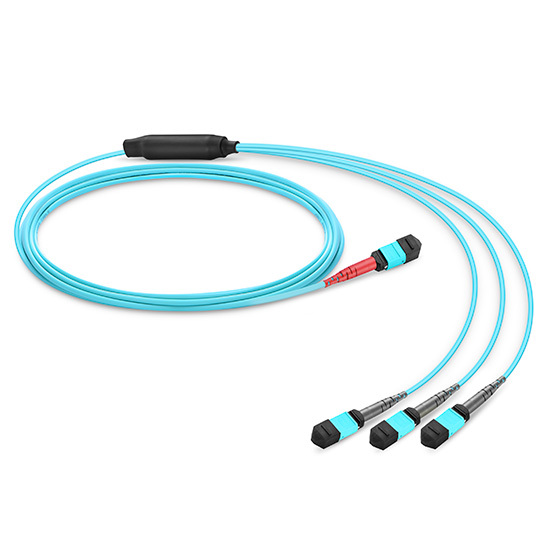 This MTP conversion cable utilizes 100% of the existing 24 optical fibers. Each fiber can be used to transmit 10G optical data. 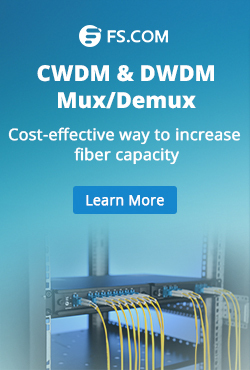 Three 40G dual-way transmissions can be achieved on the existing 24-fiber MTP cable. It can also be used to breakout the 120G CXP module signals into three 40G QSFP+ SR4 optical signals. 2*3 MTP conversion cable is terminated with two 12-fiber MTP connectors and three 8-fiber MTP connectors. 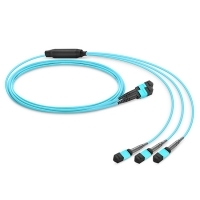 This MTP conversion cable allows three 40G-SR4 optical signal transmit on the existing two 12-fiber MTP trunk cables as shown in the following. If you have built a 12-fiber MTP cabling system. 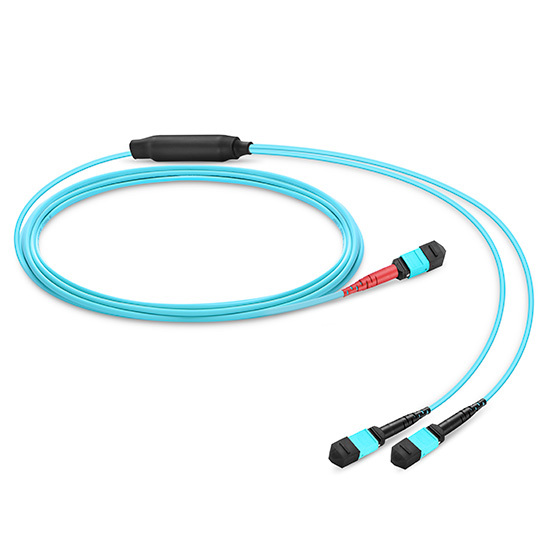 This 2*3 MTP conversion cable can increase about 30% capacity of the existing network. MTP conversion cables are designed to provide a more flexible multi-fiber cabling system based on MTP products. It can largely increase the capacity of the existing 12-fiber and 24-fiber MTP network. The above mentioned MTP conversion cable in different fiber types and cable lengths. Kindly contact sales@fs.com for more details if you are interested. This entry was posted in Fiber Cabling, MPO Assemblies and tagged 40G-SR4 QSFP+, MTP conversion cable, MTP fiber cable on March 21, 2017 by Alice Gui. 40G network is gradually being applied in today’s backbone transmission network, during which long distance transmission is required. 40G QSFP+ SR4 fiber optic transceiver is being widely applied for 40G transmission in short distances. Generally, 40G QSFP+ SR4, working on wavelength of 850 nm, can support 40G fiber optic transmission a distance up to 150 m over OM4 multimode optical fiber. Inserted in switch, QSFP+ SR4 module utilizes a MTP/MPO interface for dual way transmission. 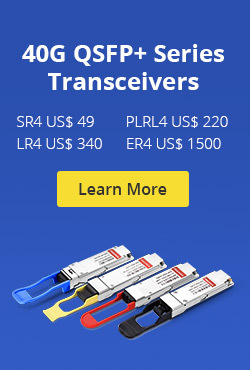 There are a lot of methods to connect QSFP+ SR4 transceivers with other devices for different applications, by using different connectivity products. In addition, the cabling for 40G is relatively more difficult than that of 10G network, which requires more cables and spaces. The following will introduce several high density QSFP+ SR4 transceiver cabling methods. 40G to 40G transmission is needed in a 40G fiber optic network. The following picture simply illustrates how 40G to 40G multimode transmission is being achieved by QSFP+ SR4 transceivers. Two QSFP+ SR4 modules are separately inserted in two 40G switches. Then the two transceiver are connected by a length of multimode MTP trunk cable. This is the simplest way to use QSFP+ SR4 transceiver. In some cases, there are lot of 40G connections required at the same time and same places, which means the increasing of both cable count and cabling difficulty. 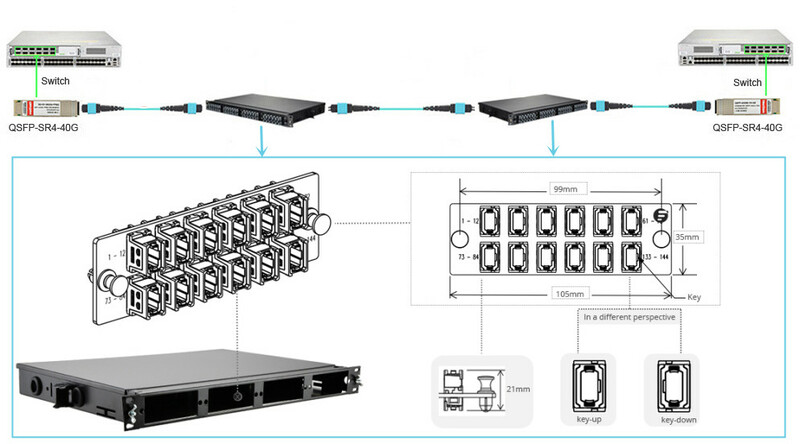 For better cable management and higher density cabling, a 48-port 1U rack mount MTP fiber patch enclosure can be used as shown in the following picture. Up to four 12-port MTP fiber adapter panels can be deployed in this standard 1U rack mount enclosure. With the help of this 48-port MTP fiber enclosure, cable management for 40G connections could be easier. QSFP+ SR4 is a parallel fiber optic transceiver which means it uses four fibers for transmitting and four fibers for receiving at the same time. The 40G fiber optic signal can be separated into four 10G signals to meet the 40G to 10G transferring requirements. The fiber optic cable count will be increased at the 10G distribution end. Usually a breakout MTP-8LC harness cable is used. 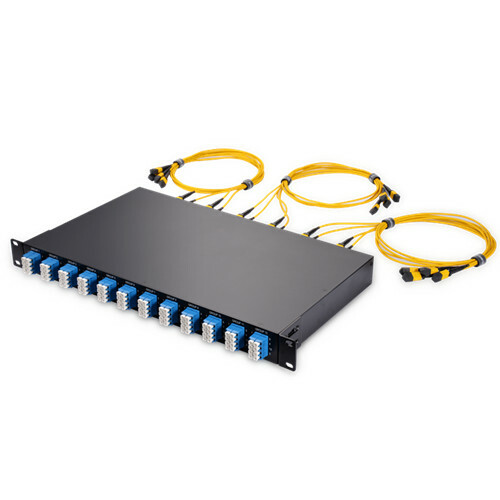 For better cable management, a 1U 96-fiber enclosure is recommended, which includes four HD MTP cassettes transferring MTP front the 40G end to LC at the 10G end. 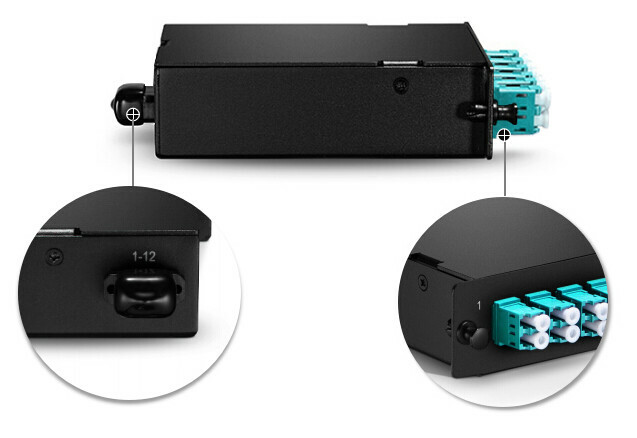 Four 10G-SR SFP+ modules, inserted in 10G switch/ports, can be connected to the corresponding LC ports on this fiber enclosure to achieve the duplex transmission between 40G and 10G. For higher cabling density, the above mentioned 48-port 1U rack mount MTP fiber patch enclosure is still being recommended, which can provide high density 40G MTP cabling environment. And additional MTP-8LC harness cables should be used for transferring signals between 40G and 10G (shown in the following picture). Depending on its parallel transmission mode, QSFP+ SR4 modules can meet a variety of cabling applications with great flexibility. The above methods is just several commonly used ones, detailed cabling methods for QSFP+ SR4 modules are depended on the practical applications and cabling environments. Related products for the above mentioned methods are listed in the following tables. Kindly visit FS.COM or click the attached links for more details. You can also contact sales@fs.com for more information about 40G cabling. This entry was posted in Fiber Cabling, Fiber Patch Cable, MPO Assemblies, Optical Transceiver Solution and tagged 10G-SR SFP+, MTP cable, QSFP+ LR4 on August 3, 2016 by Alice Gui. Fiber optic cabling and termination usually cost a lot of time and labor during the deployment of data center. Filed fiber optic termination is still being widely used in many data centers. However, with the data center increasingly depending on the high density cabling, fiber cabling and termination in data center becomes will cost more time and money if using the traditional field termination methods. Meanwhile, the fiber optic network is becoming more and more complex, which makes the data center cabling becomes more difficult. The risks of faults caused manual fiber termination will be increased. To solve problems caused by manual operations and meets the high density requirement of the data center, pre-termianted fiber cable assemblies are introduced in data center. Deploying a data center by using field termination methods might need a few days or more. Engineers have to termination a lot of fiber optic links and connect them to the right ports. To ensure there are no wrong links and bad fiber optic splicing joints, a lot of checking should be done. However, pre-terminated fiber cable assemblies, using the plug-and-play designed modules and cables, can largely improve the working efficiency, increase cabling density and decrease the total data center installation cost. In addition, the factory terminated fiber cable assemblies eliminate the need of fiber optic splicing and provide higher performance compared with field terminated fiber optic cables. The most commonly used pre-terminated fiber cabling assemblies for 40G/100G high density cabling applications are MTP/MPO fiber cable assemblies including MTP/MPO trunk cable, MTP/MPO harness cable and MTP/MPO cassette. These pre-terminated components can be directly connected to fiber optic network for data transmission. Making good use of these components can largely increase the cabling density and working efficiency in data centers. MTP/MPO trunk cable is a length of multi-fiber optical cable usually used for backbone transmission in data center. 12-fiber MTP/MPO trunk cable and 24-fiber MTP/MPO trunk cable used for 40G and 100G applications separately. There are generally two versions of MTP/MPO trunk cable—single-strand MTP/MPO trunk cable and multi-strand MTP/MPO trunk cable. A multi-strand MTP/MPO trunk cable combines several single-stand MTP/MPO trunk cables together. 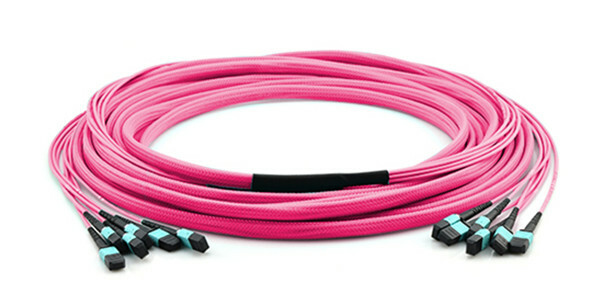 For example, a 72-fiber MTP/MPO trunk cable, as shown in the following picture, has 6 strands of 12-fiber cables combining together. Each strand is terminated with a 12-fiber MTP/MPO connector. MTP/MPO harness cable is a fanout version of MTP/MPO fiber optic cable. A MTP/MPO fiber optic connector is terminated on one end of this cable, the fanout end it terminated several other types of fiber optic connectors which are usually LC fiber connectors. This type of pre-terminated fiber optic cable is generally used for 40G to 10G transmission or 100G to 10G transmission. MTP/MPO harness cables also come into various types, the most commonly used are 12-fiber MTP/MPO to 6 duplex LC harness cable for 40G duplex transmission and 24-fiber MTP/MPO to 12 duplex LC harness cable for 100G duplex transmission. MTP/MPO cassette is a specially designed box which contains one or more small version of MTP harness cables in side it. Generally there is one or more MTP fiber optic interface on the back rear of a MTP/MPO cassette and several LC interfaces on its front rear. It can be easily installed on the rack for easier cabling as shown in the following picture. 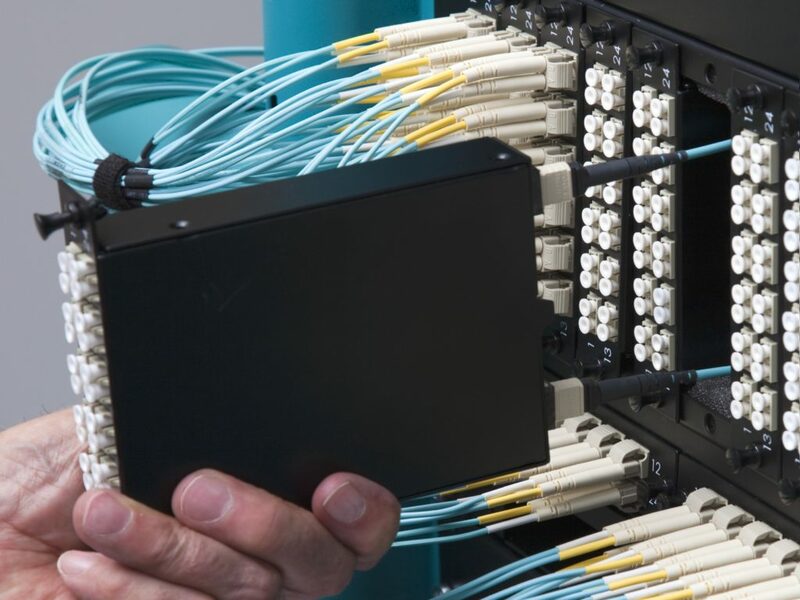 In this way, the fiber optic connections are protected in this box and more fiber optic connections can be added to the data center without worrying about space limitation. The most commonly used are MTP/MPO LGX cassettes. However, driven by increasing need for high density, the size of MTP/MPO Cassette is keeping decrease. HD MTP/MPO cassette (shown in the following picture) is also available in the market for higher cabling density. The pre-terminated fiber cable assemblies help to accelerate the data center deployment, reduce costs and error, and provide great flexibility and scalability. MTP/MPO cabling system as one the most popular pre-terminated fiber cabling solutions can perfectly fit the 40G and 100G applications. The above mentions products is just a really small part of the pre-terminated fiber cable assemblies. If you need more details, please visit FS.COM where you can customize the pre-terminated fiber cable assemblies according to your applications. This entry was posted in Fiber Cabling, Fiber Patch Cable, MPO Assemblies and tagged data center cabling, MTP/MPO cassette, MTP/MPO harness cable, MTP/MPO trunk cable on July 20, 2016 by Alice Gui.